For this post I decided to combine both medium and long distance pistol drills. For those confused please see this post for more information on what I am talking about regarding distance. The simple fact is that a decent pistol shot can make hits at 7-10 yards even without having a perfect grasp of the fundamentals; but, the further out you go, the more important those fundamental skills become. Many, many people have a response of awe when I discuss making 15 yard hits on a 3”x 5” index card. IT IS NOT THAT HARD! Especially with no time limit! But I will admit it will require some practice and effort. Remember that all of the close range drills in my last article can be performed at longer ranges, and I often do so. But some drills are just better suited for specific distances. You wouldn’t do the doubles at 50 yards with the same PAR time as say 3 yards. In my previous article I made mention that drawing to one shot leads to cheating, and through the lens of close range shooting I stand by that statement. However, the further back you go, the more you can learn from a one shot drill. At 3 yards you can sling a round at an IPSC Metric target (or IDPA target) and get close to the center. At 10 yards you might hit the target. At 25 yards you will miss. This is why we should understand the reason for each drill. This drill is simple enough. You draw the gun and shoot one round at the target. I like to start doing this at 10 yards and if I clean it 6-8 times, I start walking back to the point of utter failure and practice at that distance. I also prefer to shoot steel to minimize walking to the target to verify hits. I have a 6” x 8” piece of steel on a pole that I use for this drill. Below is a video of me running the drill once – it is worth mentioning that the piece of steel is 8″ squared in this video. I have since torched 1 inch off the sides to better mimic an IPSC A Zone. This is similar to the Doubles drill in the first article, but we make it harder by moving further back and using the head box as the target. Starting at 10 yards the goal is to draw and put two rounds into the head box or similar sized target. If you can meet a reasonable PAR time at 10 yards, move back to 15 or 20. This drill is tough and that is the goal. You will have zero success even getting the rounds on target without a proper sight picture. Your trigger press must be spot on and a flinch or anticipation will lead to a miss. When working this drill with my CCW I like to mix it up, with a minimum of 2 and sometime as many as 6 shots per run. Don’t expect hero status the first time you do this drill, but keep at it and you will realize improvement. I can assure everyone reading this, solid head box hits at 15 yards will make a 5 yard center of mass hit seem like child’s play. 15, 20 and 25 yards are great distances for working on untimed accuracy. You can purchase some NRA B8 targets or print out something similar. Staple them up and have at it. The goal is simple – the smallest group possible with no time limit. Repeatability is king. I like to run four strings of five shots each and actually measure the group. I write down the average group size as well as the smallest size. Keep in mind that at 25 yards you might find yourself at the accuracy limit of your weapon, especially if it is a run of the mill service weapon or small CCW. The name Bullseye might be misleading to some readers that are familiar with NRA Bullseye competition. I am not implying you shoot this drill in classical 25 yard Bullseye stance, but instead a normal two-handed grip. If you are feeling saucy, try it strong hand or weak hand only! I did not include this in the original article because frankly most ranges won’t allow it. But if you can perform a standard 7 yard El Presidente’ you should. But I also recommend you perform this drill at 14 and 21 yards, if you have the facilities. The drill is simple. 3 targets, 1 yard apart edge to edge. 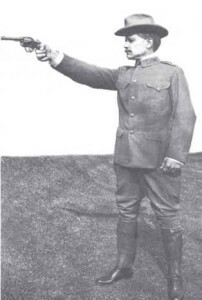 The gun is loaded with six rounds and the shooter faces up range away from the target with their hands at the surrender position, or above the shoulders. As originally designed the gun would be concealed, although us dirty, dirty gamers don’t use concealment with our competition gear. At the beep the shooter turns, draws and engages each target with two shots, then you perform a slide lock reload and shoot each target with an additional two round. This drill works many things, including target transitions and reloads. By stretching the distance we can really grasp the difference distance to target makes on transition speed and accuracy. In my personal experience my shot times are slower, but the transitions are quicker as I increase the distance. The distance makes the required target to target weapon movement less than at closer ranges. As I said above, all of the short-range drills can be performed at the medium and long-range distances, but I rarely shoot the drills above at less than 10 yards. I have some additional drills for those who shoot competition and I will cover them at a later date. Whether a competition shooter or you are only interested in practicing for CCW or self-defense, you will likely find these drills will help build skill. If you can master the drills given here and in the short-range article you will likely be among the best shooters you know. Now, get out there and burn some powder – with a purpose! Thanks for your practical informative pieces.